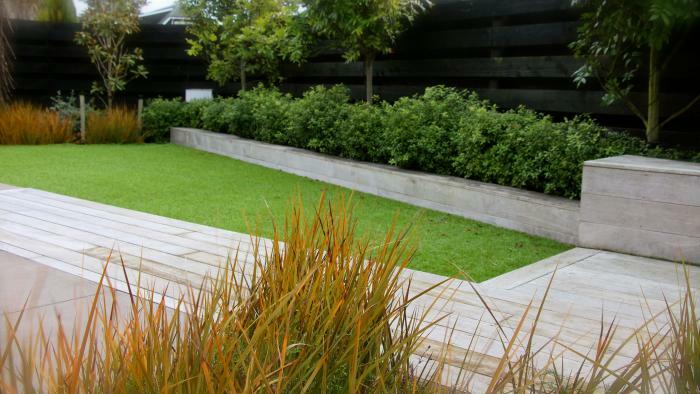 For this garden we have designed a series of raised planters, laid out on three levels, with pathways between them. The focus of the design is the planters and the plants that they will contain. The pathways have been designed for serviceability and function - low maintenance, pushing a wheelbarrow, etc. Set on a gently sloping hillside, the first stage involved excavation to form the different levels for the garden. The chickens certainly made the most of the newly turned soil, having a good scavenge! After an initial fine start to this job, the weather packed in, the rain came down and it turned into a bit of a mud bath. After a few days letting things dry out a bit we were back on the job and got the posts in for the low retaining walls. Now we are sorting out the drainage behind the retaining walls and for where the planters will go. It is important to ensure that all the water seeping down the hill is collected and diverted away from the garden, otherwise this area could become a bog rather than a productive garden. Next up is setting out and pouring the concrete pathways between the planters. Hopefully the good spring weather will continue.